The Samsung Galaxy Note 3 believes itself to be smart enough to guess the next word you type. The feature is called predictive text. It works to not only guess the next word but also complete partial works as you’re typing. For example, you may type abo and see a list of words starting with abo appear: above, about, abode, and so on. 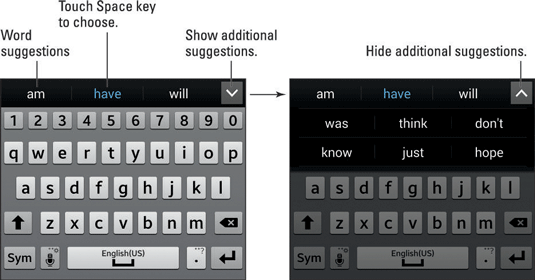 Touch a word to choose it, or tap the Space key to choose the highlighted word. In the example, the word I was typed. The keyboard then suggested the words am, have, and will, with have highlighted. Touch any word to insert it into the text, or tap the Space key to insert the word have. Touching the chevron displays additional choices. When the desired word doesn’t appear, continue typing: The predictive-text feature continues making suggestions based on what you’ve typed. Touch the right word when it appears. At the Home screen, touch the Apps icon. Touch the Language and Input item. Touch the Settings icon by the text Samsung Keyboard. The Samsung Keyboard Settings screen appears. Ensure that the master control by the Predictive Text item is in the On (green) position. If not, slide the master control icon to the right. You can touch the Predictive Text entry (not the master control icon) to view additional options and settings.